I’m sure we all know a lot of boys who love to play video games. Boys, in general, seem to be drawn to them more than girls are. I don’t know why that is but after talking to a lot of moms I know, and taking a look online, it seems to be true. 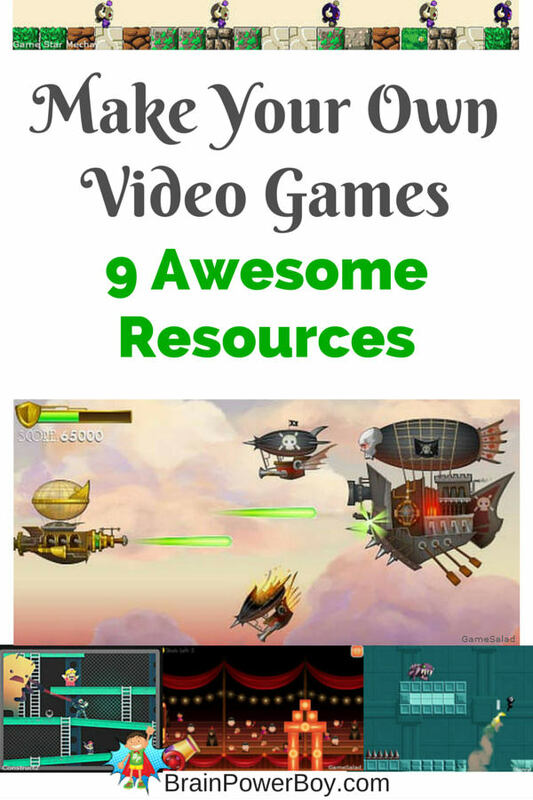 We have been working on increasing the amount of Homeschool Unit Study topics we have on the site and since boys are so into video games I thought a unit study on making your own games would be nice. I don’t mind my son spending time online because I know he is learning a lot while he is on the computer, but I also don’t care for some of the more mindless entertainment that seems to be readily available. I would rather have him working on a project in Minecraft, playing some physics games, or trying to make something of his own. If you feel the same way, why not introduce them to some of these neat websites and get them creating their own games as well. They will certainly learn a lot in the process. Making your own games is challenging but so rewarding. Gamestar Mechanic is recommended for kids 7 – 14 years old. It is more focused on gaming design than on coding. There are limited features when you use the free version and there are upsells of sprites and game design instruction. You actually play a game to learn about game designing. You can then create your own games. I linked to the parent page so you can read about it. More advanced and thus harder to use Stencyl is a great way to make games. Like Scratch, Stencyl has a snap together format but you can also write code within the game if you wish. There is a free version with limitations. If your boy gets good at making games there is a bit of info on selling their games as well. That would be neat, wouldn’t it? GameMaker Studio is another free version with limitations program. It is for anyone from beginner to advanced designers. Sandbox Game Creator has very nice graphics. This one hasn’t been updated since 2013 though I know schools were using it in the last few years so I am not sure why it has not been updated. I put it in because since quite a few schools use it some kids might already be familiar with it. If you have not used it before I would likely try the others first. Kudo is a game creator using a visual programming language. You have to download (free) it to your computer to use it. You do not need to know how to program to use this and it is for all ages. We can’t try everything but this is one we plan to do soon. Let me know if you and your boy have used it. You can also take a look at Sploder. I like the Retro Arcade and Physics Games game designers. This is one of the easier platforms to use. FYI: There is also a Classic Shooter game designer area. Construct 2 offers a limited free version download. It is an HTML5 game creator in 2D with no coding experience necessary. It has a WYSIWYG layout editor which is great and it also lets you resize, drag and rotate objects right on screen. The button for the free edition was at the bottom of the linked page when I wrote this. Game Salad is another choice game creator. This is a very slick looking game designer. It has a drag and drop interface. I would like to give this one a go as I like the graphics that are showing in the examples. Even a bit of steampunk there! Wonderful graphics and an amazing product, the basic Unity3D is completely free (it used to be $100.00.) I will tell you up front that it looks incredibly complex. I would take a look at your boy and his knowledge and frustration level to see if this would be a good one to try. The panels have a Lot of commands. Definitely for the more advanced game designer. My son plays games that were created on Unity3D and they have amazing graphics. Keep in mind that within these game designing sites they showcase games that others have made. We have played some fun and interesting games there. However, I have also seen some very dark games, as well as violent and even bloody looking games in the showcases and galleries. Some platforms have more of this than others. Check them out to see what works for your family. Video games are likely to remain an obsession for a lot of our boys. Let’s see if getting them making their own would add something good to the mix. This is a great post for me because my 9 year old son wants to make a video game! Perfect, perfect! Thanks for sharing, pinning! I’m glad to hear you can use it! I hope he has fun. Love Portal! Hope you find some resources she can use. I think Kudo or Sploder would be great for a younger child who is just starting out. How cool! Thanks for linking up to the Frugal Family linky! Oh, my, wow! What a great idea, my son would be really interested in making his own video game! I hope your son enjoys making his own game. I think it is a great way for boys to learn a lot while doing something they will enjoy.